Now What? : Ever feel like your flying without a co-captain? Days like these I wish I woke up in another dimension. It wasn't as if I was having a bad day but that I was just havig a day of inconveniences. It is as if they all came at me at once. For a person with obsessive compulsive disorder, it can get frustrating very quickly. Firstly, the cough is lingering and because of the human body's hormone effects to the mucous membranes at night I wake up hacking in the middle of the night. I keep a clean tissue on me at all times so I can cough into it instead of my arm or hand. I stash antibacterial gel under my pillow to wipe my hands and I keep my canteen of water by my side for the dry sore throat. On a side note: TG is now waking up around midnight and 3am for a diaper change. We are now down to 2 changes a night! Anyway last night was brutal. I woke up twice hacking up my lung. It wouldn't be so bad if it was a productive cough but I was dry and my gag reflex was on overload. 7:30am: Could it be we licked this daylight savings time and sleep? Could TG be back to her 7:30am wake up routine instead of the 4-5am wake up? I'm not too sure. Yesterday's pm nap ended at 7pm with her bedtime at 9:30pm. It's anyone's call but I'm not complaining. I'll take 7:30am over 4am! As I'm lying in bed finishing up the early morning nursing session, I think to myself, we missed two weeks of swim classes already, once because TG was ill and once because I was ill. I didn't want us to miss three in a row especially because of me. According to the doc I am no longer contagious so I woke up planning to go to swim class wih TG. DH didn't think it prudent but knew he couldn't stop me. DH was running late and asked me to take Z-girl for her walk and if possible find a hardware store to make a copy of the mailbox key for him. DH is now missing his car key and mailbox key. 10am: Breakfast done. Dishes being washed in the dishwasher. Bag for swim class packed. I check out the weather and pull out outfits for TG and myself and discover her winter coat isn't in the radio flyer wagon by the door. In fact, her hat and her fall rainbow knit hoodie sweater is missing as well. The last time I saw them was on her body during an outing with DH. I email him to see if he knows where they are. I find the mittens in DH's diaper bag. A clear sign that they haven't been worn even during that 40 degree day last week. Still no sign of her coats and hat. DH responds, "I only had it on her once." Thanks dear, that doesn't help me. I search my tiny one bedroom apartment and come up empty. Time is running out. Guess, we'll have to layer her denim jacket with a fleece hoodie. I'll be wearing her most of the time outside so it shouldn't be too bad for her but it's irking me. I'm obsessive compulsive. I need to know where her brand new winter coat, fall sweater coat and hat are. 10:30am: TG is dressed. I'm dressed and we head out to walk the dog. As I open the door my phone rings. It's my Mother. She never calls me. She always texts me to call her. I don't get it but I won't ask. As we get outside, I ring her on the phone and we chat for a bit. The call ends after my Mom gets a bit defensive when I light heartedly mention her and her sisters are drama queens sometimes. in my defensive I did say that we all can be drama queens sometimes. 11:20am: I was supposed to be on the subway by now but I didn't want cut my Mother short. I strap TG in her Ergo, grab her diaper bag and beeline to the subway. It takes two trains to get to swim class. Thankfully the trains are running on schedule this weekend. 11:45am: On the platform for the local train to take us to swim class. TG is getting antsy. My bulky winter coat, her layers and the warm train station stop aren't helping. She snacks on some pasta as we wait for the train. I discuss with her how we'll just make it but we'll need to skip the dawdling and get dressed into our swim clothes as soon as we get there. That's when it hits me. I don't have my bathing suit on. Usually, I will put my suit on under my clothes so while I'm at the locker room, I can focus the time on changing her clothes and not my own. Between searching for the winter outwear and my Mother's call, I forgot to put on my swimsuit before heading out. Now, it I had forgotten my daughter's swimsuit, she's young enough that a swim diaper would have sufficed but I'm gathering my birthday suit for a Parent and Me swim class would raise a few eyebrows. I could just kick myself now. I trudge us home just in time to miss our class. I'm sorry baby girl. 12:15pm: I make it home and quickly change TG's diaper and pack our diaper bag. 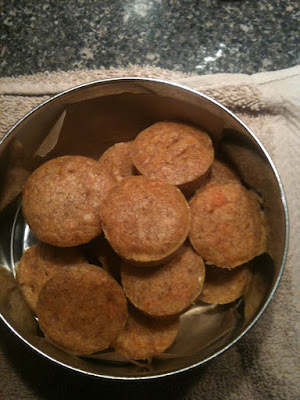 We may have missed swim class but at least we can take a trip to the local chef store for a mini muffin tin. If you recall, during my second trimester of pregnancy (February 2008) DH said we needed to move. Fearing that I'd be as big as a whale and unable to do anything in the dead of summer, I packed my entire kitchen and put it in storage. After I gave birth, I asked DH to slowly bring a box back. To date, I have seen no boxes. Since we had a 'playdate/brunch' scheduled for tomorrow, I thought it would be a nice idea to make apple/date mini muffins for the kids. Without supplies, I need to restock. DH said the car was parked in the valley. We live at the top of a giant hill. To get to the valley I either take a short cut that involves stairs through our subway stop or walk a winding hill that goes the opposite direction of where we needed to go for a brief period of time. Normally, I avoid the short path when taking the stroller but the last time I took the stroller and the long path, it was to find out I wasted 15 minutes because DH took the car seat out of the car. With a bad taste in my mouth for the long path and the day going the way it has already, I opted for the short path. As soon as we got out of the house I noticed a little hair bow. It looked sort of like TG's. As I got closer I realized it was her hair bow but it must have been there for quite some time because it was trampled upon and broken. Argh!! Her set is incomplete now. It's an OCD thing. It is what it is. I hear the local all girl school marching band playing and I recalled how the Archbishop of NYC was saying mass nearby. I stroll TG into church so she can see and hear the band. She's tired but fascinated. She keeps hitting her stroller to the beat. The archbishop waves at TG. I greet some fellow parishioners and feel a bit better and at ease. This weird funk will pass. 12:45pm: I head towards the short path to the car and not one but two people offer their assistance carrying the stroller down the steps. I remember that it's the small acts of kindness that make the world better. I head out of the short cut tunnel and make a right and look for the car. And look. And look. I make it 3 NYC blocks down and decide, I have to call my husband. This is where I usually second guess myself. "Did I miss the car? Could I have been so preoccupied I walked past it? PG, you are so fixated on the missing coats. Maybe there in the car. DH probably took them off her and left them in the car. Did I read right, he said 'right', right?" I call DH and he says it should be one of the first cars out of the tunnel. I then repeat what he emailed me, "To the right." "Yeah, Oh, I meant left. Sorry." For the life of me, I really don't know how he handled being an actor. When the director said stage left, did he have to stop and figure out what that meant? "I'm really having a bad day and this isn't making it better." "I know. Sorry. Bye." By this time, TG is overtired and I'm cranky. I pack her in the car and look around for the winter coat, hat and fall jacket. Not in the car. The status of said items is looking bleak. As soon as I make it to the highway, TG falls asleep. I spend the next 1.5 hours driving slowly and waiting for her to wake up. After this morning's chaos, I didn't want to wake her for a silly thing as buying a mini muffin tin. Thankfully, I hit traffic so that eats up a lot of the nap time. As I'm sitting in traffic I realize that in my haste, I packed just a few wipes and no diapers. That's ok, I say. I have the emergency stash in the trunk. We'll be fine. 2:30pm: TG wakes up. We head to the shop and what started as a trip for a mini muffin tin became retail therapy. Sadly retail therapy doesn't involve splurging on anything for me perse. I wind up spending more $$$ on DH. I leave the chef store with a very light wallet and a cranky child who is tired of sitting in a stroller, sitting in a car or being worn. I've reached my max for non-child centric activity. We head home. The cashier asks if I want a paper bag or if I have a reusable bag. I do have one but wanted to beeline home so I ask for paper. I try to use my reusables exclusively. This one time will be ok. We get to the car and I think to myself we should change her diaper. I open the trunk to find the emergency stash of wipes are gone. I surmise that in DH's haste, he packed the emergency stash in his diaper bag which explains why he had two packages of wipes in his bag. I sigh. 4:30pm: We hit traffic but with some local street maneuvering we make it home and find a parking spot a half a block from home. Yippee! Thank goodness for small things. TG is revved up. She knows we are home. I get her out and she pitches a fit when she sees I'm preparing the stroller for her. I don't blame her but I wasn't in the mood to chase after her while wheeling the stroller and carrying the bag of goodies. I consider carrying her and pushing the stroller with the shopping bag in the stroller. It would take me longer to get home but not as long as letting her walk. I reach for the bag in the front seat and as I pull it up, it rips in two. Lovely. While TG sits on my hip smiling and giggling, I grab the reusable bag from the trunk and squat near the front seat and pack the goods. TG is going to have to deal with the stroller. She pitches a fit but I finally get her snapped in. We head home. 5pm: DH emails me that he is skipping the gym and heading home. I ask him to search for the outerwear when he gets back. I tell him it is really irking me. He obliges. Darkness has fallen so the playground is out but I wanted TG to get some energy out and play so we head down to the lobby of our apartment building with her doll stroller and she has a blast walking around. She then spends 30 minutes in our mail room trying to use my keys to open the mailboxes. She's so cute on tippy toe trying to fit the key in. She understands the concept of the lock and key but I don't think she knows yet about turning the key nor does she have the dexterity to put the key in but you can see the cogs working this all out. I lean against the wall and enjoy watching her brain in motion. 6pm: DH comes home. He takes Z-girl out for a walk with TG to give me a moment of peace while making dinner. I start dinner and start on the brunch eats. 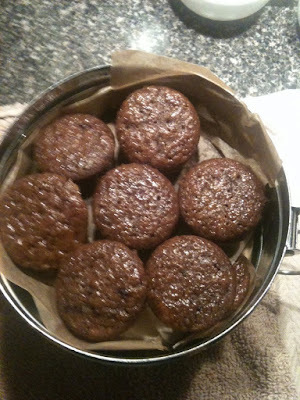 I'm making apple date mini muffins for the kids using TG's birthday cake recipe. 1am: I try to continue baking and brewing myself some throat/cough soother but TG wakes up. Apparently nighttime parenting is exclusive to me. "She's unconsolable at night. She doesn't want me. She wants you." I'm up jotting down my day and making brunch eats. I've decided I should bring three small things. Mothra shows her crazy head. I'm going for a dim sum theme. We've got mini apple date muffins, mini sweet potato pancakes and mini baked scrambled egg. I'll set the oven to cook the eggs tomorrow while I'm at church. I figure, I don't know what the other parents will be serving but at least I can bring some eats that I know TG will eat. See, there is a method to the Mothra madness. I know DH is doing alot. He's back at school. He's studying to be a trainer. He's gone back to acting. He does do a lot to help around the house and with TG but I feel like I'm the scout trooper leader. Shouldn't there be two? I'm the one trying to be prepared. I pack and clean out his and my diaper bag. DH doesn't like my diaper bag. It has too much 'preparedness' packed in. I update our calendar with to dos to keep track of what and where. I schedule the doctor's appointments. I research the studies on vaccines and H1N1. I grocery shop. I plan and make TG's food. I plan and make our meals. Which isn't easy when your husband is calorie counting and a finicky eater. I dust the house. I clean the bathroom. I tidy the kitchen. I handle nighttime parenting. I wake up in the middle of the night to do the dishes. Yes, I can't wait until the am while I'm making breakfast to do the dishes. I like to start the day with fresh clean kitchen. I wake up in the middle of the night to tidy the toys strewn about. I sort the laundry. What drives me nuts the most is his waning short term memory. I always joking passed his mother's concerns about a history of Alzheimer's in their family but this isn't good. Is it that he's preoccupied with things in his mind that he doesn't focus in the here and now? He's lost his canteen twice. He cannot recall a conversation he had with a neighborhood 90 minutes prior. When I ask him to measure out the ground meat and the spaghetti portion, he only remembers to do measure the meat. I can't tell if it's a short term memory loss due to physiological reasons, ADHD or just plain not focusing in the here and now. I'm really starting to worry. Of course, the missing coats and hat are still eating me up. I started searching for them again while I was waiting for the sweet potato to bake. DH said, "I know I said I'd look for it but I figured I look for it when we had a moment. I don't know what you want from me. I only had her in her winter coat once and I remember thinking I don't like the coat. It's too hard to put on. I don't plan on using it again." I'm not sure what moment he thinks is right because the weather is getting colder and with a toddler awake is not the moment to search a house. By the way, that statement about not using the coat again only adds to my thoughts on what may have happened to her coats and hat. To me the subconscious plays a big role in our actions. I don't know if I'm more annoyed that we possible have lost two brand new jackets and a brand new hat or if I'm more disappointed at the lack of concentration and focus and the lackadaisical attitude. I know this too shall pass and that I'm just having a day of inconveniences but just like the inconveniences amass became something more, I'm afraid this too will grow into something larger. I wish I could be a better wife to my husband. I feel like I'm being an advocate for my child and I should be more of an advocate for my husband. It's just hard for me when I feel at times I'm the only troop leader for this family. Time to make the sweet potato pancakes. By the way, I know very well that trying to cook three things for a brunch at this hour is absolutely insane, especially as I'm still battling this cough thing. Between DH and myself, we both can't be sane all the time.